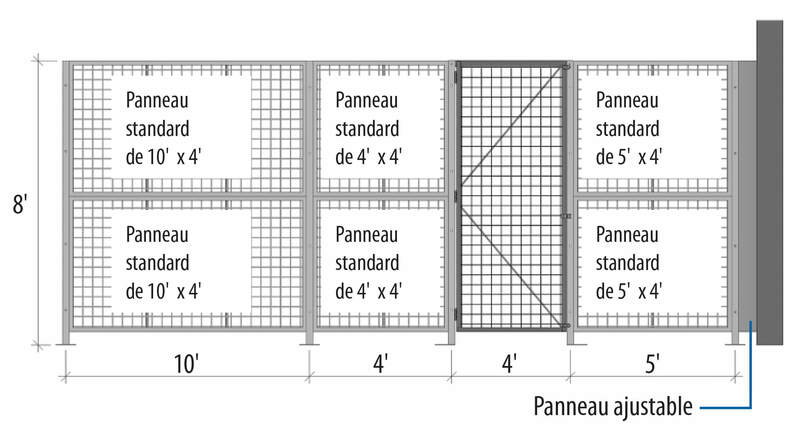 With our wire mesh walls, create a safe storage or work space where you need it. This all-steel system is durable and maintenance-free. The open mesh lattice partitions let the light shine through and allow free air circulation. Modular assembly with bolts and nuts. Anchor bolts sold separately. Made of 2” x 2” x 10GA welded wire mesh framed in 1 1/4” x 1 1/4” x 12GA structural angle with two welded ø1/2” reinforcement rods. Padlock hasp and hinges included. Track is included for sliding doors. Standard padlock hasp (padlock by others). No charge. Included with all doors.